An angle is the figure formed by two rays sharing a common endpoint, called the vertex of the angle. We can classify angles according to their size and position. If an angle is greater than 0 degree but less than 90 degrees, then we call that angle as acute angle. The following is an acute angle. An angle whose measure is greater than 90 degrees but less than 180 degrees is called an obtuse angle. Thus, it is between 90 degrees and 180 degrees. The following is an obtuse angle. Example: 150 degrees, 120 degrees etc. An angle whose measure is 90 degrees is called a right angle. A right angle is marked on the diagram as a small square. An angle whose measure is 180 degrees. A straight angle looks like a straight line. The following is a straight angle. An angle whose measure is greater than 180 degrees but less than 360 degrees. The following is a reflex angle. A revolution is an angle that equals exactly 360º. If sum of two angles are 90 degree then they are complementary angles. 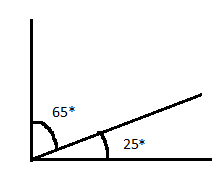 For example: Angle measure of 65° and 25° are complementary angles. But angle 65 and angle 25 do not have to be adjacent to be complementary as long as they add up to 90 degrees. If sum of two angles are 180 degree then they are supplementary angles. 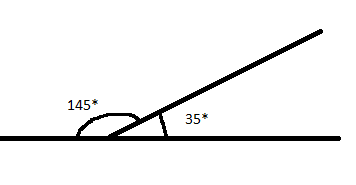 Angle measure of 145° and 35° are supplementary angles. 1. What is the measure of a right angle? Angle with a common vertex and one common side. In the following figure ∠ 1 and ∠ 2, are adjacent angles. Angles that have a common vertex and whose sides are formed by the same lines. Vertically Opposite angles are always equal. The following figure represents vertically opposite angles. 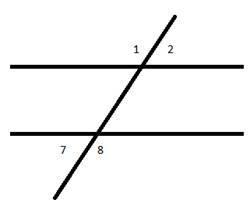 When two parallel lines are crossed by a third line (Transversal), 8 angles are formed. In the adjoining figure, ∠3, ∠4, ∠5, ∠6 are interior angles. In the adjoining figure, ∠1, ∠2, ∠7, ∠8 are exterior angles. Pairs of interior angles on opposite sides of the transversal are Alternate Interior Angles. ∠3 and ∠6are alternate interior angles. ∠4 and ∠5 are also alternate interior angles. Pairs of exterior angles on opposite sides of the transversal. ∠1 and ∠8 are alternate exterior angles. ∠ 2 and ∠7 are alternate exterior angles. 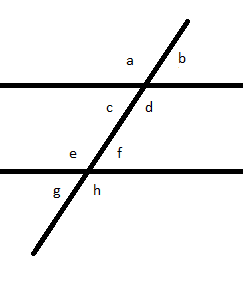 Pairs of angles in matching corners are called Corresponding Angles. 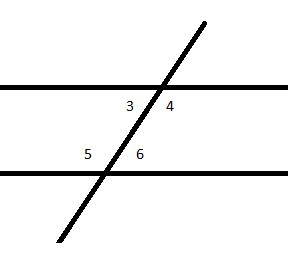 ∠1 and ∠5 are corresponding angles. ∠2 and ∠6 are corresponding angles. 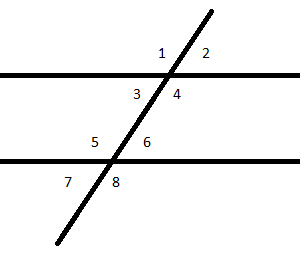 ∠4 and ∠8 are corresponding angles. 1. Write 1 pair of alternate exterior angle. 2. Write 1 pair of corresponding angle. Now try it yourself! Should you still need any help, click here to schedule live online session with e Tutor!